Live Nation is kicking off the summer concert season by making one million tickets to over 1,000 shows across the country available for only $20. Starting Tuesday, you can get tickets to some of the hottest concerts of the summer for just $20. 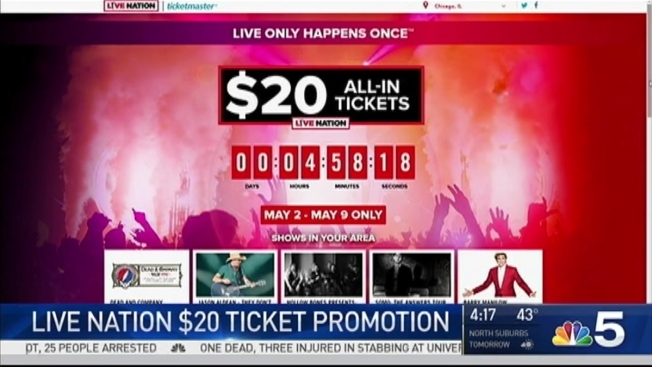 In celebration of National Concert Day, Live Nation is offering one million concert tickets at a reduced price for a limited time only as part of its "Kickoff to Summer Ticket Promotion." From 8 a.m. Tuesday, May 2 until 11:59 p.m. on May 9, music fans can buy $20 tickets to more than 1,000 participating shows across the country. More than 30 concerts in Chicago are among the nationwide events that can be purchased for the special price. See a full list of nationwide shows available in the $20 concert ticket offer here. Buy tickets by visiting Ticketmaster and Live Nation's "Kickoff to Summer" website.